Continuing on from Pulmonary Tumours, this week we take a quick look at Pleural Tumours. To review any normal histology or anatomy go to the Pulmonary Tumours week. An understanding of the clinical examination of the respiratory system may also be useful. Arises from serosal membrane lining, including pleural, cardial, peritoneal and scrotal cavities. In this case the pleural type is of interest. 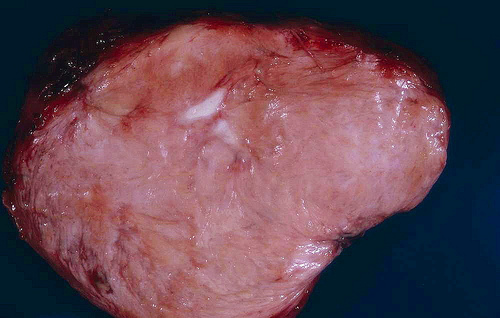 This tumor presented as a pedunculated intrapleural mass arising from the visceral pleura. Although most of these tumors are benign, microscopic features such as mitotic activity, necrosis, cellular atypia and size greater than 10 cm. may correlate with malignant behavior. Metastases can also spread to the lung pleural (e.g. lung, breast, ovary). Videos are thanks to WashingtonDeceit. Material is sourced from my notes from pathology tutorials at UQ, and Robbin's Pathologic Basis of Disease. References for images are underneath the image.